Two Chicks On Books: Blog Tour - FEAR MY MORTALITY by Everly Frost A Guest Post & Giveaway! 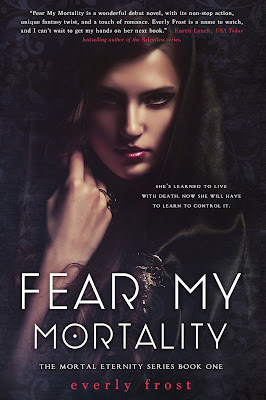 Blog Tour - FEAR MY MORTALITY by Everly Frost A Guest Post & Giveaway! Hey y'all! 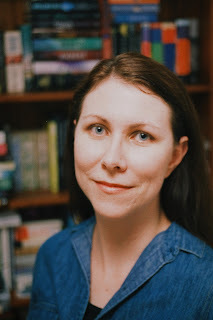 I have a guest post from Everly Frost, author of FEAR MY MORTALITY! I am freaking in love with this book!!! Oh and stick around for the giveaway! Haven't heard of FEAR MY MORTALITY? Check it out! Hi! I’m excited to talk about my top 5 favorite scenes from Fear My Mortality today. The first is the Implosion ceremony, where each country’s 16 year olds prove their regenerative abilities. It’s a life changing moment for Ava, but it also shows that even immortals have something to fear. The second is the scene in the green room. I won’t give too many details to avoid spoilers, but I love this scene because Ava digs deep and finds her courage. The third is when Michael turns himself into a human shield. This scene isn’t all about invincibility – there are risks for Michael, both physical and emotional. He takes a chance and puts everything on the line. The fourth is when Ava dances in the park because she finds a moment to be herself again. And the fifth scene is when Ava becomes a shield for Michael. Despite being mortal, she protects him. And most of all, she doesn’t give up on him, even though trust is such a hard thing to find.